The number of apps in the Android Market may be growing at a healthy rate but do all those apps do well? Well, not quite, especially if it is a paid app. 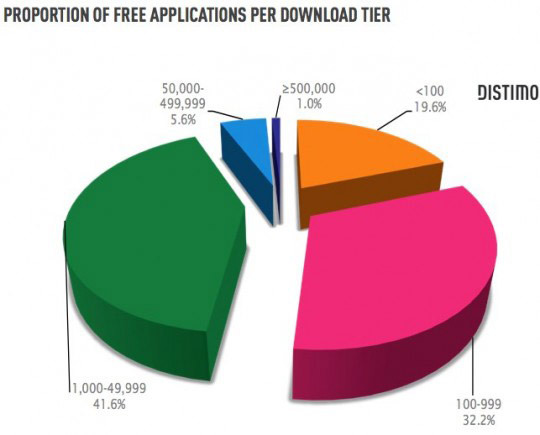 A new report released by Distimo suggests that about 80% of the paid apps get downloaded less than 100 times. 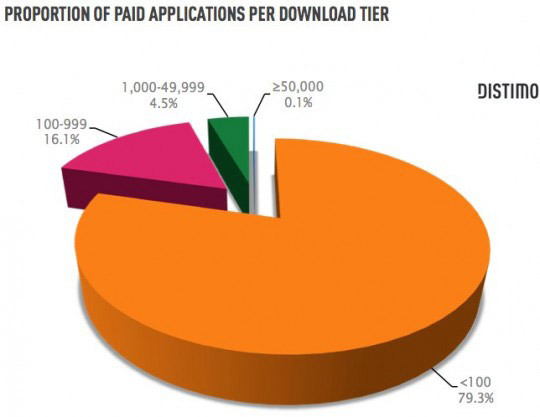 As you can see from the chart above, only 0.1% of the apps actually get downloaded more than 50,000 times. When it comes to gaming , only five titles on the Market have crossed the 250,000 mark worldwide till now. In comparison, the same figure was achieved by ten iOS games in just two months, that too only in the US. According to Distimo, only two paid applications on the Market have been downloaded over half a million times worldwide to-date whereas six paid applications on the App Store achieve the same number of downloads in two months in the US alone. This concurs with the previous reports that suggest Android users are less likely to buy apps than iOS users. There could be several reasons for that. One would be the quality of apps themselves isn’t on par with those on the App Store. Sure, the latter has its fair share of garbage apps but the good ones are generally a notch or two above than what you would find on the Market. When Android users see that the apps don’t have the same quality as their iOS counterparts, they don’t feel inclined to spend money on them. Second would be the mentality of the Android users, which would prevent them from buying apps. Android users may be users of open source software on other platform and hence not used to paying for them. As such they would ideally search for free alternatives instead of paying for the apps. Also, app developers often provide free versions of apps that they sell for a price on the App Store because they know most Android users don’t buy apps. These apps often earn their revenue through ads. In this way these developer make the users used to downloading apps for free and turn it into a vicious circle that affects other developers. Third reason could be games, which is what brings the most number of customers to the App Stores and something that Android still lacks. There are a few but most of them are ports of iOS games and others are not interesting at all. Last would be piracy, which is a much bigger issue on Android than iOS. On iOS, you would need to jailbreak the device to be able to install apps outside the App Store. On Android, all you have to do is transfer the application file on to your phone and then install it using a file manager. The ease with which this can be done leaves users with very little reason to actually pay for their apps. Distimo also feels the fact that the top ten charts on Android Market does not refresh with the same regularity as the one on App Store could be a reason. Since users keep seeing the same apps again and again, they never find out about great new apps that might be there somewhere on the store. In the end, the App Store continues to be a more lucrative destination for application developers. Unless Google takes some measures, neither the developers nor Android users are going to benefit from this situation.